The Commission on Population and Development convened governments, UN agencies, civil society actors, and others to its 51st Session (CPD51) in New York from April 9- 13th. The theme of this year’s Commission was “Sustainable cities, human mobility and international migration”. Unfortunately, member states were unable to reach consensus on the outcome document as some member states did not want to agree on any clauses that would predetermine the Global Compact on Safe, Orderly and Regular Migration currently under negotiation at the UN. This Commission however, saw strong cross-regional collaboration on advancing the issues of migration. Transnational support was expressed from member states that had never before spoken out strongly on these issues. 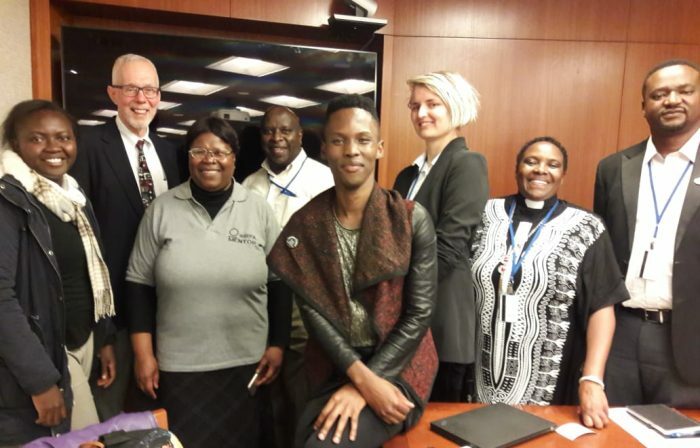 Action by Churches Together (ACT Alliance) was present at CPD51, with a delegation of ACT members and partners from around the world that are committed to working towards gender equality, and are leading programmes that incorporate sexual and reproductive health care services, advocacy or normative work in their settings. ACT Alliance recognizes that human dignity is a foundation to human rights, and that conceptions of human dignity have historically arisen out of faith and religious traditions. ACT also recognizes that gender equality and access to sexual and reproductive health and rights (SRHR) is a prerequisite for the enjoyment of all human rights and for poverty reduction. Access to SRHR which includes access to health care services, information, family planning, etc., is crucial and should be accessible to all regardless of migration status. Globally, there are 32.3 million women refugees, half of them being girls, who are affected disproportionately by emergencies. Women, children and adolescents, especially girls, face an increased risk of unwanted pregnancies, sexually transmitted infections, including HIV, human trafficking, child, early and forced marriage and other forms of sexual and gender based violence, and their needs and rights largely remain unprotected and unengaged. Considering these crucial times of international mobility, it was unfortunate that member states could not reach consensus on all aspects of social protection for all during CPD51. ACT welcomed the opportunity to engage in CPD51 and to deepen the discussion around religion and SRHR in general, and in particular, in the context of human mobility and migration. ACT Alliance and partners including the World Council of Churches, the United Nations Population Fund (UNFPA), German Justice Commission, and Islamic Relief USA hosted a public side event at CPD51. The side event facilitated an interactive panel discussion, bringing FBOs from many faith traditions, working on human rights advocacy as well as on development and humanitarian service delivery, together with secular humanitarian NGOs and UN representatives. Panellists explored the nexus between faith-based actors and sexual and reproductive health, looking at the theological underpinnings and interpretation of sacred texts that defined their approach to SRHR and services. ACT delegates showcased their experiences and perspectives as FBOs on integrating SRHR into their health, youth and other programs. Last year (CPD50) was the first time that a platform under the CPD hosted an inter-faith event supportive of the rights-based sexual and reproductive health narrative. At CPD50, there was consensus amongst various civil society organizations for increased dialogue around faith and religion-related aspects and SRHR related aspects. “I am grateful that we as a faith-based family, and religious leaders were invited to participate in the discussions,” said Bishop Stephen Kaziimba of the Anglican Church in Uganda. “We need to work together in order to help people to live life in its fullness. I remain committed to promote human dignity,” he continued. In reference to this year’s theme, ACT Alliance recognizes that faith-based organisations (FBOs) have the potential to reach out to and offer security to marginalized communities, including people on the move and those in fragile or rural settings. “The theme of the CPD this year was crucial as the needs and rights of some of the most marginalized people in the world, particularly migrant women and girls, requires urgent resolution,” said Kelly, reflecting on conversations with the ACT delegation. Substantive progress is desperately needed in view of the grave human rights infringements and consequences for population policies by the growing numbers of refugees, migrants, and displaced people in the world today.